Bubbles are great to play with any time of the year, add a scent to them to make them even more fun! Bubble Base: Make your own bubbles or use commercial. To make your own, experiment with good dish soap, water, and glycerine or sugar to make bubbles that work well. I have an experimental version here. If you want a recipe, check the resources section at the bottom of that post. Tip: Water makes a difference. If you have hard water, use purified or distilled water instead. Scents: Use unsweetened flavored drink mix, food extract, or essential oils. #1. Use unsweetened flavored drink mixes by adding 1/8 tsp at time until you like the scent. #2. Add your favorite extract 1 teaspoon at a time as you mix. #3. Stir in 15-20 drops of your favorite essential oil to your bubble solution. Wands: Use old wands, make your own shapes out of chenille stems, use different sized straws, make paper cones, use your hands, etc.. Make giant bubbles with a length of string and 2 sticks. Here’s a video showing how to make a giant bubble wand. 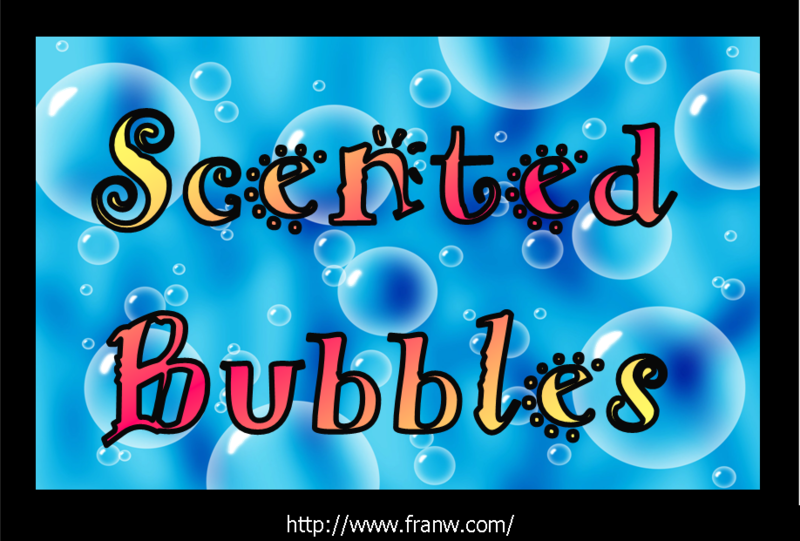 I hope you enjoy making and playing with scented bubbles!